Question: What’s your favorite book from childhood? Heather Maloney, Library Director: It was a Helen Keller biography and had the sign language alphabet in the back. Pam Adler, Public Services Assistant: Green Eggs and Ham by Dr. Seuss. I still have the book from my childhood. Black History Month Display includes books and DVDs by and about African Americans. Don’t forget to check out the suggested titles for the National African American Read-In (NAARI) designated with a bright yellow bookmark.​ NAARI titles on display are only a selection of a much more expansive list of books on the National African American Read-In at UCBA Guide. The guide represents selected “Must Read” Books by African American Authors available through UC Libraries and​ was created in conjunction with UC Blue Ash College’s annual National African American Read-In (NAARI) event:​. Stop in the UCBA Library this month and borrow a book or DVD from the display! Question: Do you have any reading goals for the new year? Lauren Wahman, Instruction Librarian: Ah, yes. I’m going to make another attempt at noting what books I read throughout the year. I sometimes pick up a book only to find that I’ve already read it! 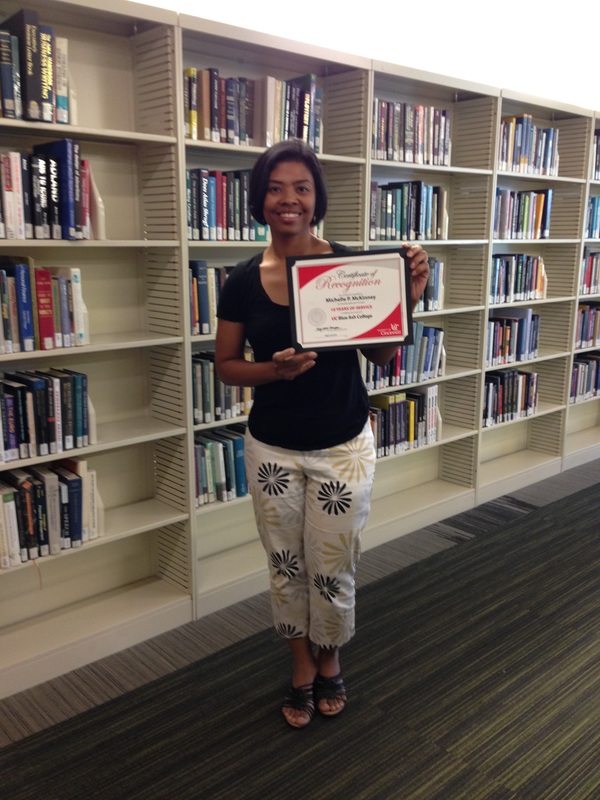 Rachel Lewis, Technical Services Manager: My goal is just to “read”. Julie Robinson, Library Operations Manager: Hmmm, more time for reading! Pam Adler, Public Services Assistant: No! No goals, no pressure when it comes to reading for pleasure. UC Libraries Article Linker has been updated with a cleaner interface to provide more streamlined access to full text articles. Users will also be presented with additional options for locating articles that are not available in full text via UC Libraries. View the video to learn more. Question: What books are on your Christmas list? Heather Maloney, Library Director: Giada De Laurentis’, Happy Cooking. I like to go to the bookstore during Xmas break and find a reading book more serendipitously. Michelle McKinney, Reference/Web Services Librarian: Looking forward to reading Sara Addison Allen’s latest book, First Frost. She’s one of my favorite authors. Lauren Wahman, Instruction Librarian: I’ve got quite a few eBooks that I’m waiting on from the public library! A few that I’m looking forward to are Kristin Hannah’s The Nightingale, Michel Bussi’s After the Crash, and David Mitchell’s Slade House. Rachel Lewis, Technical Services Manager: I don’t have any books on my Christmas list. Question: What genres do you rarely read? Heather Maloney, Library Director: Biographies. Weird because they interest me, I just don’t pick them up often. Kellie Tilton, Instructional Technologies Librarian: Mystery. I don’t have the patience to wait to the big reveal at the end. Lauren Wahman, Instruction Librarian: Romance and western. These just aren’t my thing so I don’t ever read them. Rachel Lewis, Technical Services Manager: Books….LOL!. Does the research guide you use regularly suddenly look different? It is different – the research guides changed platforms and design this week! Click on the image to browse the redesigned UCBA guides. In addition to the new look and feel, the UC Libraries Research Guides now have a responsive design, enhanced browsing functionality and are more user friendly for table and mobile phone users. These changes and more incorporate accessibility design features required for any University of Cincinnati web pages and 3rd party web based products. Find out more about accessibility requirements at UC. 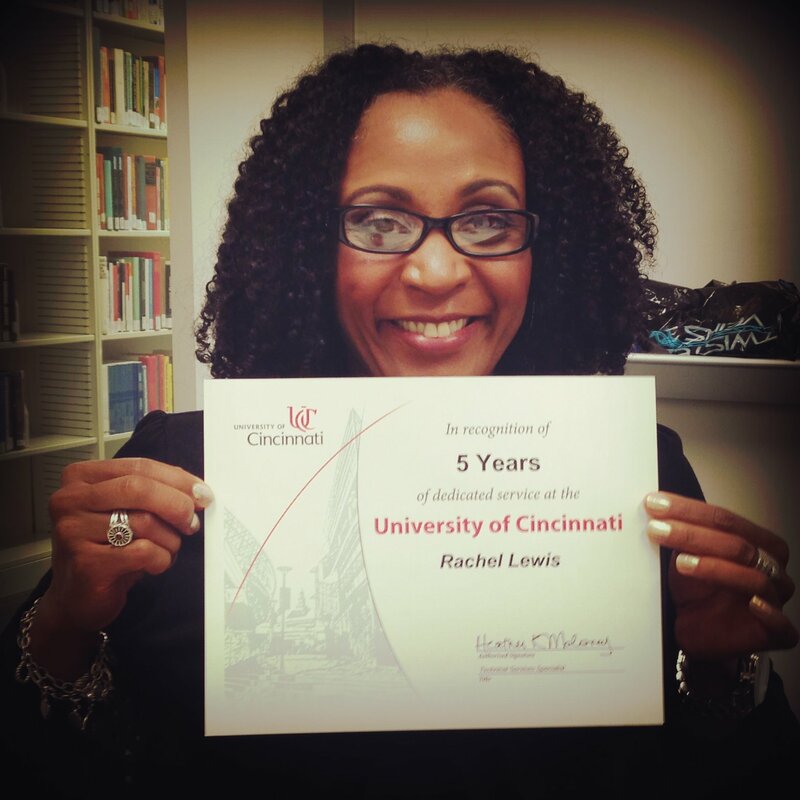 Technical Services Manager, Rachel Lewis celebrates 5 years of service at UC Blue Ash Library. Congratulations on 5 great years and we look forward to many more!